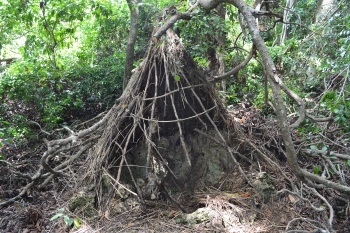 The Mijikenda Kaya Forests consist of 11 separate forest sites spread over some 200 km along the coast containing the remains of numerous fortified villages, known as kayas, of the Mijikenda people. The kayas, created as of the 16th century but abandoned by the 1940s, are now regarded as the abodes of ancestors and are revered as sacred sites and, as such, are maintained as by councils of elders. The site is inscribed as bearing unique testimony to a cultural tradition and for its direct link to a living tradition. The cultural processes are also impacting beneficially on the natural values of the site. I flew from Zanzibar to Mombasa, where I stayed at the Castle Royal Hotel, which dates from 1909 and is centrally located between the Moi Avenue tusks and Mombasa Old Town. I made a day trip from Mombasa to Kaya Kinondo, one of the Sacred Mijikenda Kaya Forests UNESCO World Heritage Site (http://www.kaya-kinondo-kenya.com). The kindest thing that I could write about Kaya Kinondo is that its universal value escaped me; perhaps I need to consult a dictionary to get a clearer definition of the word "universal." To me, it seemed like I was walking around an ordinary wooded area, although I did see some wildlife (black-and-white colobus monkeys, horn bills and footlong millipedes). Kaya Kinondo was, very likely, the least interesting WHS that I have visited. 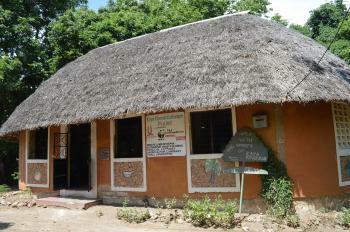 The Mijikenda Kayas are a beautiful environmental and cultural sanctuary. The sacredness of the sites is incredible and visitors are not allowed to venture into certain areas but the birds and the trees make you see nature at its best. The serenity and religious awe of the sites is thrilling and I was very privileged to partake of it. There are no entry fees but a guide has to come from the nearby villages. Once in Mombasa Kenya, one can find their way to the sites which are scattered in Kwale, Kilifi and Mombasa through a local tour operator. I recommend visiting the Fort Jesus museum for more information. You will definetly appreciate the calmness of the Kayas after the hustle and bustle of typical tourist zones.